Cap toe ballerina with twin buckle ornamentation on vamp. Leather linings and leather padded insole with extended arch support. Composite sole. 3/4 inch black leather stacked heel. Made in Italy. 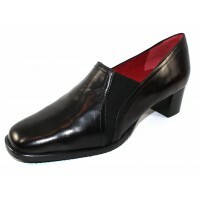 Cap toe ballerina with twin buckle ornamentation on vamp. Leather linings and leather padded insole..